Lately I've found myself really getting into using face oils at night instead of a traditional moisturiser. 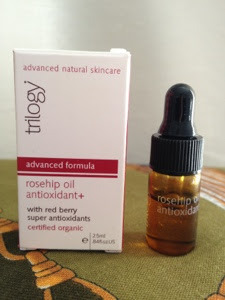 I was given the Trilogy rosehip oil in my Latest in Beauty advent calendar and have been using it for the last week. A certified organic oil, it contains essential fatty acids and antioxidants to help boost your skin. You use about 3 drops of the oil and massage it into your face, letting it sink in. The oil has a very slight scent, but this isn't noticeable once it's been absorbed I find that I need about 4 drops for my whole face, paying special attention to my cheeks as they get drier than everywhere else. The oil sinks in quite quickly, and when I wake up in the morning, my face looks really refreshed and smooth, but without any greasy residue. I've been really impressed with this oil. On the box they state that you can use this day and night, but I prefer a lighter moisturiser in the daytime as I don't always have much (any, in fact) time to wait for an oil to sink in when I'm dashing around trying to catch my daily train. I would definitely buy the full size of this. My tiny 2.5ml sample is still half full after a week's use. A 20ml bottle retails for £16.50, not bad considering that it would last almost 3 months. Have you tried anything from Trilogy before?